Brand new!! Get a Stainless Steel Bowl with your Bosch Universal Plus Machine along with the reg. white bowl . Included with the Stainless Bowl is the new lock on base for the Universal Plus, the splash ring and clear lid. All the same great features that the regular Universal Plus but with a Stainless Steel bowl as well. The Stainless steel bowl will let you make the same amount of bread that the white bowl makes, but will also let you whip things that especially need to be cold like whipping cream or even pastry. Take advantage of this great offer to get both bowls as this great price. Well after 20 years we finally see a new design to our wonderful Bosch Universal. The sleek new unique shape and more powerful motor plus many more new features make this machine worth waiting for. We are impressed with the easy way it went together as well as the smart new look and the great job it does on all tasks we try with it. It still makes 4 loaves of 100% whole wheat bread and will whip anything from an egg white to a gallon of icing. The cleanup is easy as well, in the dishwasher and the inside steel shaft of the bowl lock off to clean inside as well if you wish. 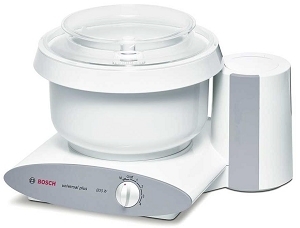 Bosch has sold this series of mixer since 1950 and its quality is renowned. They have a much higher than average lifetime for mixers in this class and a vary high customer satisfaction rating.